A couple was walking through the woods in Ireland when their dog began making a commotion. He had discovered a tied-up garbage bag full of newborn puppies! They were taken in by two rescues, who are now searching for the despicable person who left them to die. Laura and Robert were shocked that their dog made such a find in the undergrowth of Garryhinch Woods in County Laois on Sunday. They hurried the puppies back to their car to get them warmed up. The puppies had been in a black garbage bag tightly closed with a cable, and would have soon faced certain death. Knowing that they would not be able to keep them all alive themselves, Robert contacted a rescue group to take care of them. Cara Rescue Dogs took on five of the puppies, while Laois SPCA took the remaining four. Sadly, one of the pups, a female, didn’t make it. But hopefully with Royal Canin’s donations of emergency puppy milk, the rest will thrive. 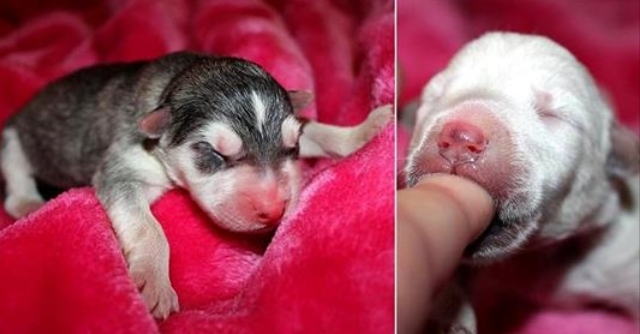 Responses to "Hero Dog Saves a Litter of Abandoned Day-Old Puppies"